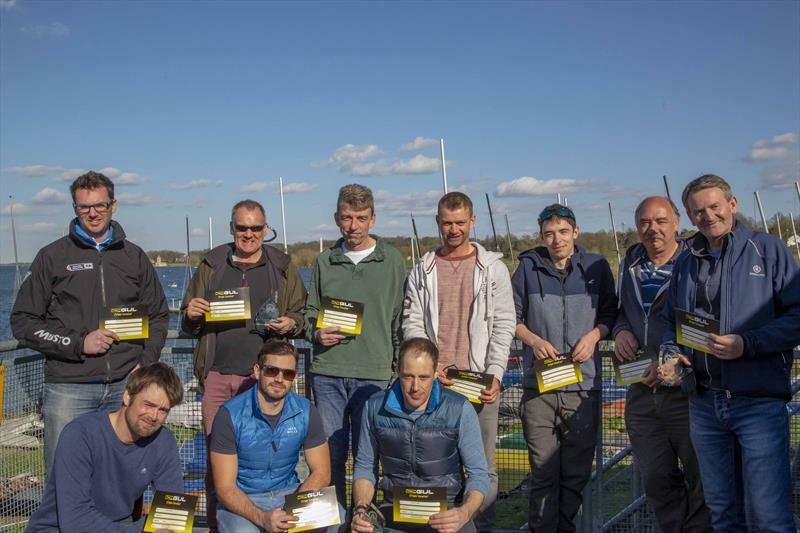 The traditional season-opener took place at Rutland on 23rd/24th March, with the fleet welcoming some new faces in the shape of Kevin and Stuart Moore and the return of some old (or should I say experienced) faces: past multiple champions Dave Hayes and Sean Dwyer. Saturday's weather chart promised no isobars over most of the UK, but we arrived to flags flapping which at least was much better than expected. At the briefing we were told the race committee was measuring 5 knots gusting 10 down in the course area, so preferring to believe 10 rather than 5 we rigged and got going. Race 1. The start was nothing if not keen - one who shall remain nameless later admitted being so far over that he was invisible to the race committee! Three-quarters of the way up the first beat Performance Sailboat Repairs (James & Anne Gardner) looked as though they would nail it from the right hand side, but a final spin of the roulette wheel saw Blue Badge (Mike Bees/Pete Nicholson) on the left round first from Betty B (Dave Hayes/Sean Dwyer). Blue Badge were the only boat to fly a kite on the leg between the inner and outer loop windward marks which gave them a comfortable buffer in which to sail their own race from there on. Bodge, the oldest ship in the fleet by some margin (Paul Roberts/Rob Taylor) won the battle for second followed by Betty B and PSB, these results being affected by some disputed OCSs. Race 2. After being delayed by a breakdown en route to Rutland Brightmile (Mark Watts/MJ) joined the fray. The breeze had softened a bit and continued its trend of lifting starboard tack on the right side of the course and port tack on the left, with a 'no mans land' in the middle to be crossed at some point. Middle right looked good for Betty B but at the last roll of the dice Blue Badge came in from the left ahead of 755 (Kevin & Stuart Moore) in only their second B14 race. Again Blue Badge went for the early hoist and sailed away. 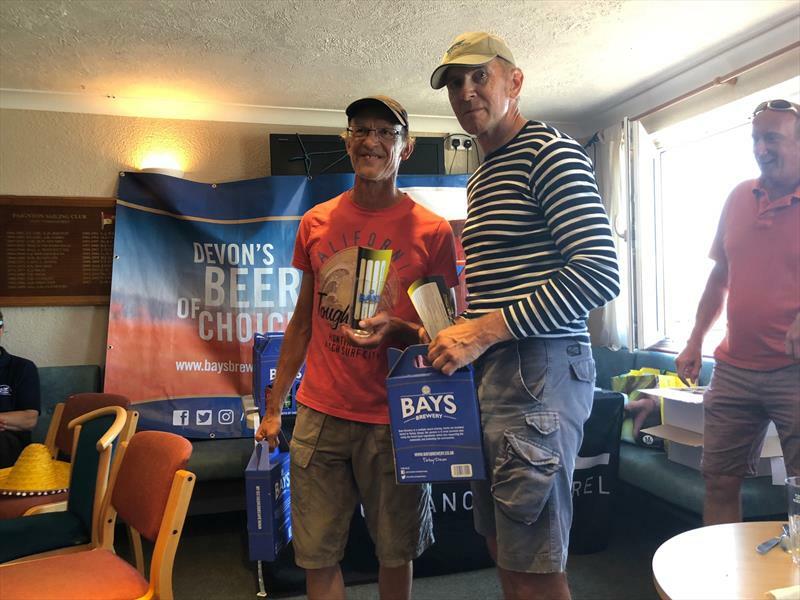 Eventually Bodge and Brightmile pulled through for a race-long dice for 2nd place which was settled in that order with Trunky (Kathy Sherratt/Jon Dixon) taking fourth. Race 3. The breeze was now showing signs of dying off altogether and flicking ominously to the right, so the PRO signalled just two laps. Sure enough the wind flicked right shortly before the start leaving those at the boat end looking initially famous, but as in the first two races the smart money was on the left - that is until the last few hundred metres before the top mark when it filled in from the right with good pressure. The first three (Trunky, Brightmile and Betty B - not necessarily in that order) rounded very close together and parked up in a hole. By the bottom mark things has resolved themselves a bit with Betty B leading from Brightmile, Trunky and Bodge. The first two stretched away in their own private battle, with Brightmile sliding through on the second beat. The last run provided more opportunities. with a risky detour out to the right hand side bringing more pressure and a massive shift. Brightmile took this for a clear first. Blue Badge got their act together late in the race to pull through to 4th on the second and final beat, and then also spotting the express route took Trunky down the run to steal 3rd. Saturday night and with an early finish in the sun Team Raynes hosted a boat based social to kick off the evening. The 4pm drinking ultimately moving on to the class social at a local restaurant (thanks for organising Kathy - top job) which with some clever negotiation by Team Raynes led to cleaning out the old stock of red wine and a great evening of catching up after the winter break. Sunday dawned bright and breezy - 10 to 12 knots with the promise of it building throughout the day. The lure of breeze and a prompt 10 o'clock start saw everyone up early. Some were more successful in obtaining breakfast than others - the look of disappointment on the face of Wigan Man (aka MJ) was both palpable and pitiful has he opened his long-awaited bacon sandwich (ketchup at the ready) to find... no bacon. Bless. Race 4. The PRO switched us from the previous day's outer loop course to the inner loop, which caused a few surprises for those not entirely familiar with the sailing instructions. Brightmile AKA Wonkey Donkey had clearly spent breakfast time successfully foraging the club grounds for thistles and shot off into the distance leaving Trunky in 2nd and Bodge in third occasionally threatened by Blue Badge. On the first beat Betty B had fallen victim to the blind spot of an RS800 with its kite up which put them well back by the time they had untangled. Bodge had a run-in on the third beat with a 4000 coming downwind which dropped them back behind Blue Badge, who slowly reeled in Betty B and squeaked past on the final downwind leg to take second. Race 5. The wind was building and now topping 18 knots in its more solid moments. The fleet approached the first windward mark in a tight bunch, whereupon the breeze played its joker - a 20-knot 20-degree lifting gust on the right - allowing Blue Badge to beam reach in to the mark at full chat. They gybed off and cleared out, leaving Brightmile, Betty B, Trunky, and Bodge to fight over second. 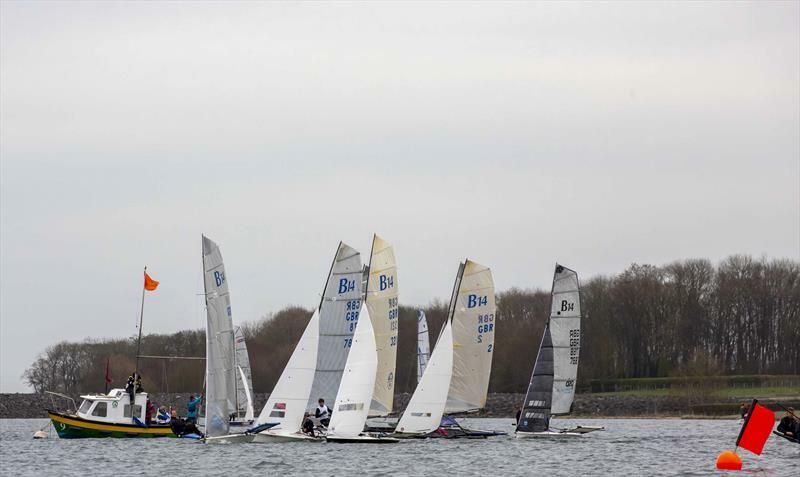 Some confusion over the number of laps to be sailed resulted in over half the fleet finishing a lap early, which had to be resolved in the club office after racing. Once things were straightened out the order was Blue Badge, Brightmile, Betty B, Trunky, Bodge. Race 6. 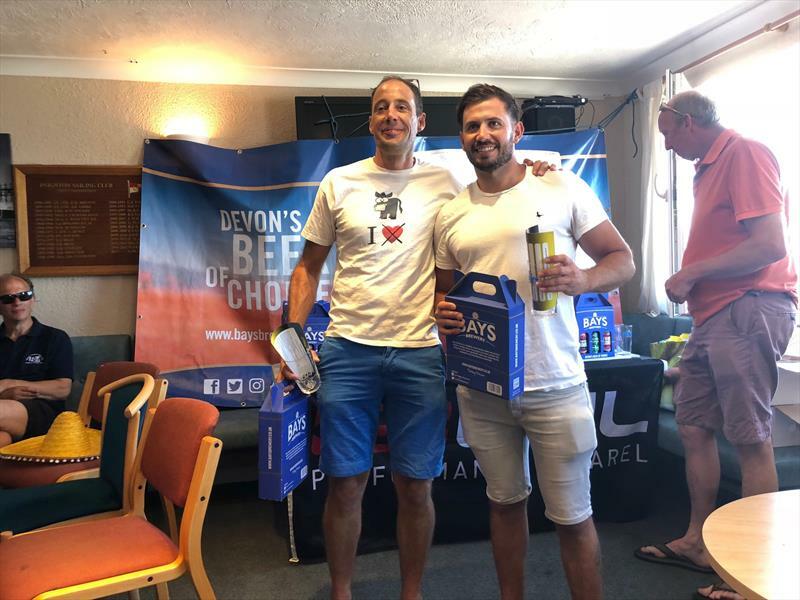 Blue Badge were now unassailable, but the remaining podium places were all up for grabs. The PRO switched us back to the outer loop course which made things interesting with the windward mark right up under the shore in the shadows of Half Moon Spinney (so it says here on my Ordnance Survey map). Brightmile led from Blue Badge, but the latter gained the lead by gybe-setting out into the breeze. Brightmile went left and dropped back on second beat leaving Blue Badge with a fairly easy (barring some traffic avoidance near-misses/near capzises to windward in the Rutland holes) ride to the finish. Betty B again came in third ahead of Bodge and PSB. Blue Badge took a well deserved win with their usual tactical mastery from Brightmile and the returning legends of Hayes and Dwyer closing out third. 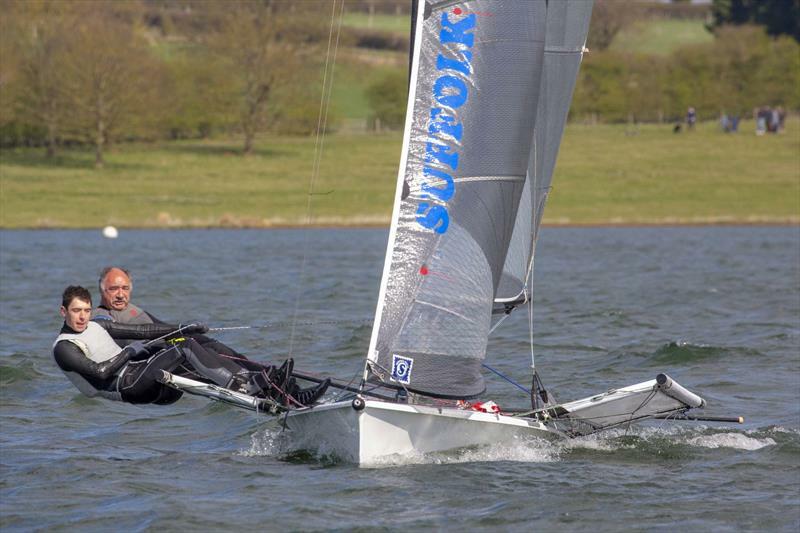 This amazingly means two of the three boats on the podium are sporting bionic upgrades to shoulders and knees... the class are unsure whether to be astonished by this or concerned this is the latest craze to gain that small performance edge! 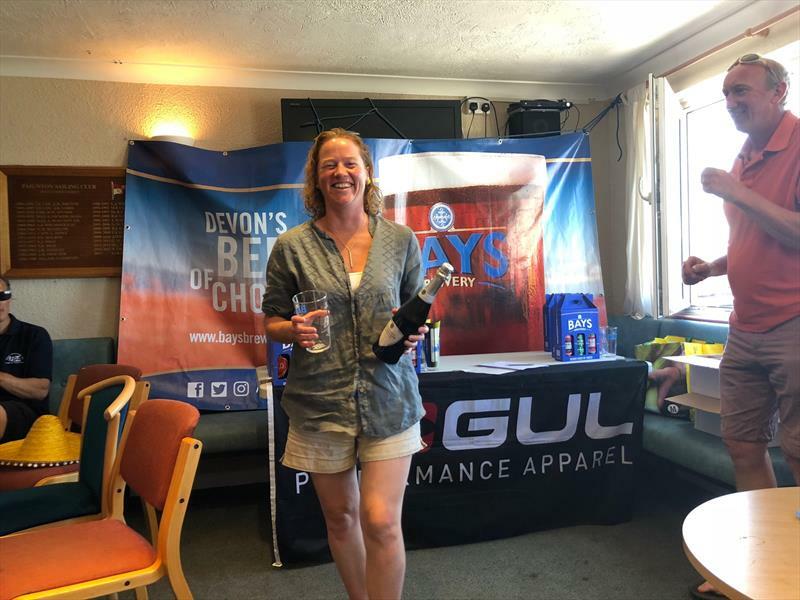 The first four overall were awarded vouchers from our generous series sponsor Gul, along with Kevin and Stuart Moore who were awarded the merit prize for an excellent showing in their first ever event. The format of separate start and finish committee boats (a technique Rutland SC have perfected with the RS Sprints event) worked really well giving minimal waiting around time between races by leaving the start boat free to start a fleet as soon as all the boats from that fleet arrived back from the finish line. Combined with a 10am first start on Sunday this meant we were off the water at around 1pm to enjoy refreshments in the sunshine. Big thanks to Rutland Sailing Club and all their volunteers and helpers for putting on a great weekend's sailing. 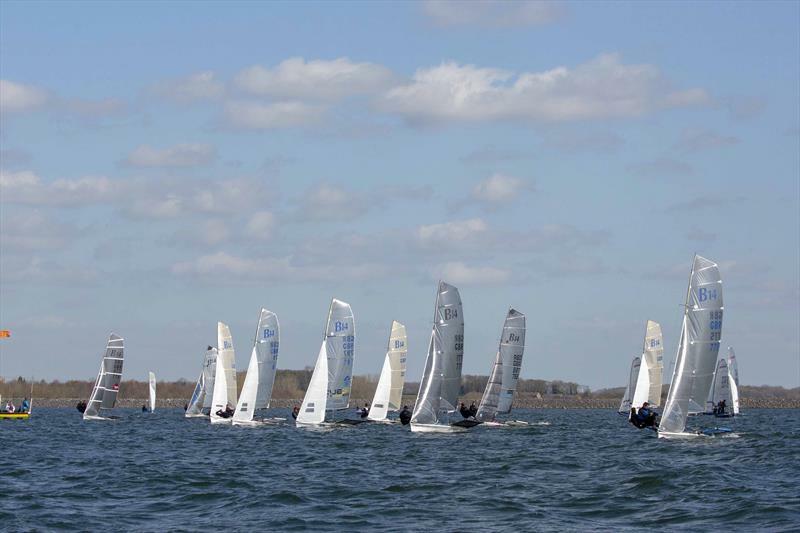 The next Gul B14 TT event is at Stokes Bay on 13/14 April, followed 3 weeks later by the National Championships at Restronguet as the fleet builds towards the Worlds in Carnac in July. After two days of frustration the final day came up trumps with blue skies and a steady 8 knots of breeze, initially from ENE but tracking E as the morning wore on. 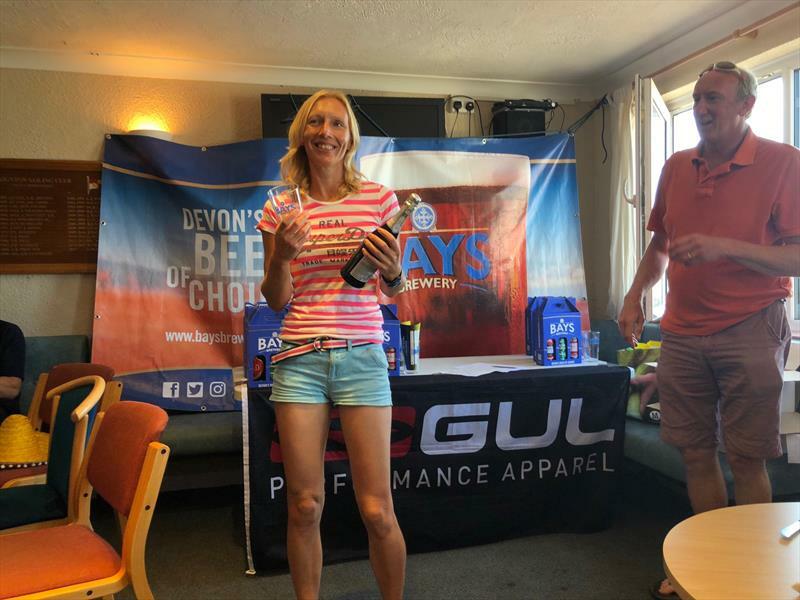 The objective was to get four races to give a total of nine completed for the Gul B14 Championship supported by Bays Brewery and Seavolution. An awkward swell/slop/chop combination made for a challenging day, especially for the crews on the foredeck who were treated to regular cooling irrigation. Race 6 started with a slight dash of pin end bias. Multiple World and National champion Tim Harrison, now sailing with his wife Anna Marriott, lined up for a trademark port tack start but thought better of it with less than a minute to go. The early leaders all came from the left with Trunky (Kathy Sherratt/Josh Wilce) leading at the top from Harrison/Marriott & Blue Badge (Mike Bees/ Pete Nicholson). On the 2nd beat Tim & Anna hit hard left again to jump into the lead at the top mark. Blue Badge gybed on top of Trunky down the final run to nick 2nd. Championship organiser and Margarita-master Tony Blackmore & crew Super-Meg put together a great race to take 4th from Abacus(Crispin Taylor/Gi Harrill). Race 7 mixed it up a bit with the Torquay right-hand track is establishing itself. Peter Knight and Alex made the early running, in fact they made all but the very late running when Blue Badge rolled over them on the way into the finish. Tony & Super Meg went one better and took 3rd ahead of Tim & Anna with Simon & Nikki Hadley kicking of a run of top 10 results in 5th. Race 8 resulted in a general recall at the first attempt, but got away cleanly on the restart. Blue Badge locked into the right hand groove early for another win, with Trunky keeping them honest in second ahead of Brightmile (Mark Watts & Matt Johnson) who were having a bit of a mare with assorted random never-had-that-happen-before spinnaker issues. Peter & Alex (4th) and Tim & Anna (5th) continued good runs to pull themselves up the overall leader board. This left Blue Badge in the overall winners seat, but not entirely trusting their maths they stayed out for the final race and a last dose of Torbay sunshine. Race 9 then was to decide the remaining overall places on the leaderboard. Blue Badge, with the pressure off, again hit the right to lead around the top from Trunky and Brightmile (or was it the other way around?) who were having an intra-family battle for 2nd overall. On the 2nd beat the breeze started to soften. Blue Badge appeared to throw the bucket out the back (or possibly had snagged some of the weed which was floating around in some quantity) and fell into the clutches of the chasing fleet. Trunky led around the top but was rolled by Blue Badge on the hoist, with Brightmile 3rd. Blue Badge gybed early on extended a little for another win, just ahead of Trunky. Brightmile had a that's-only-ever-happened-once-before-and-that-was-earlier-today random spinnaker issue and dropped back. Peter & Alex eagerly snapped up 4th place followed by another 5th place for the Hadleys. All this left Blue Badge as overall winners, followed by Trunky and Brightmile. Steve Hollingsworth & Elliott Holman had a disappointing day to drop to 4th overall ahead of Tim & Anna. 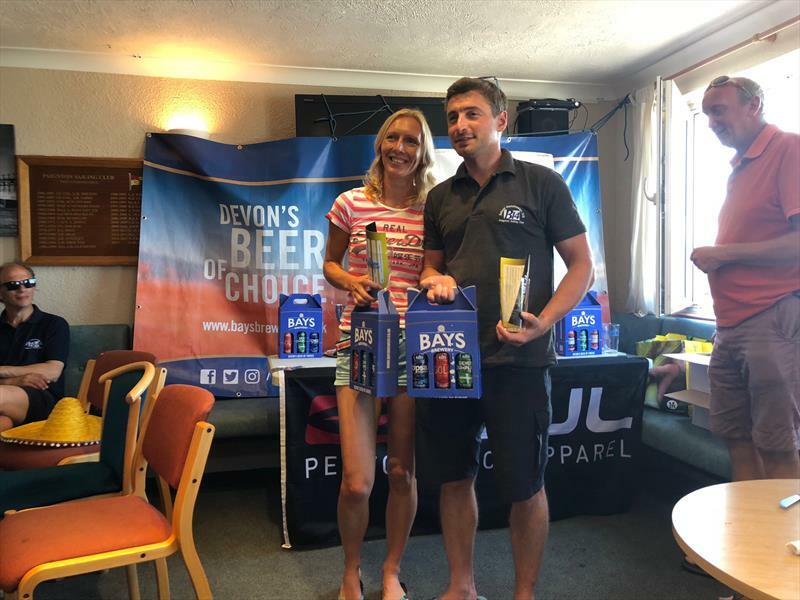 Winners of the 'classic' fleet for pre-Ovington hulls were Alicia Clifford and Charlie Hadley, ahead of Ben Lloyd-King and Jez Page (who unfortunately missed the final 2 races with gear failure) and Patrick Seyler & Stacey Bray. Best newcomers (attending their first championship) were Mattias Lange and Helge Ludwig all the way from Blankeneser Segal Club in Germany. 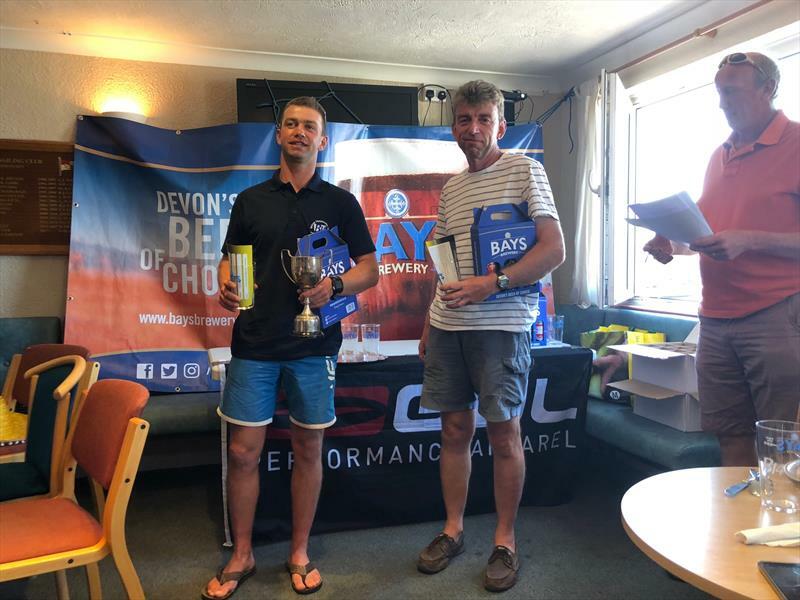 The B14 fleet would like to extend a huge vote of thanks to all of Paignton Sailing Club for putting on a great event. Race officers Ian Bullock and James Ripley along with their team did a superb job in some very trying conditions. Jane & Calvin in the kitchen turned out huge quantities of lovely food. Simon & Katie in the bar went above & beyond the call of duty by going out to buy bottles of Sambuca and on request and worked tirelessly well into the night. The beach team led by Arthur made sure we all remembered our tallies, and put a lot of effort into lugging our trolleys up and down the sand to make our life easy. A very similar day to yesterday. A postponement ashore again waiting in hope that a sea breeze - or any sailable breeze - would materialise. After a short wait on the water, the air movement stabilised sufficiently for PRO James Ripley to set a course and get a start away. Blue Badge (Beezer & Half Pint Pete) led off the pin, but bottled it and put in a textbook "cross the fleet while you can" hitch which handed the lead to Abacus (Crispin Taylor & Gi Harrill) who gradually extended into an unassailable lead. Snapping at Blue Badge's heels where Gul/North Sails (Alan Davis & Char Horlock) and Trunky (Kathy Sherratt & Josh Wilce). This order remained until final run when, as the breeze waned from 3-4 knots down to 1-2, Gul/North Sails pressured Blue Badge into leaving their gybe in to the finish too late to take 2nd. The fleet were then sent ashore in the hope that things would improve, but alas it was not to be. Mexican evening with fancy dress and Tequila in the boat park was a fair substitute, followed by quantities of great Mexican food provided by Paignton Sailing Club. The forecast for tomorrow looks more promising, so with the top 5 boats within a few points and the potential of a 2nd discard bringing one or two others into play it is basically a reset and start again.